Slip into an irresistibly velvety and subtly scintillating body milk. It moisturises the skin and enhances it with a delicately perfumed caress. 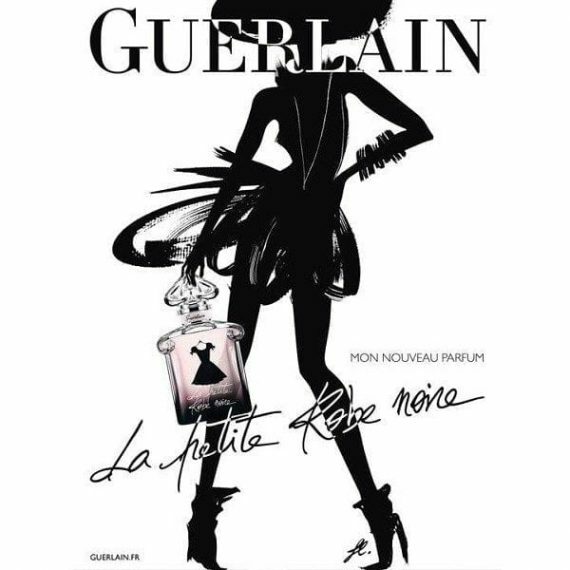 Guerlain La Petite Robe Noire is an absolutely essential and utterly irresistible perfumed creation inspired by the elegance and eternity of a little black dress. The perfume radiates Parisian chic and gracefulness with notes of black cherry, bergamot, red berries and almond, heart notes of Bulgarian and Turkish roses, further developing with notes of licorice and smoked black tea. Aniseed, tonka bean, vanilla, iris and patchouli form the base creating an irresistible fragrance contained within its legendary bottle, fading from black to powdery pink, revealing the silhouette of the little black dress. A moderate lasting perfume that is available as an EDP, EDT, Intense EDP, seasonal Gift Sets and fragranced body products such as body milk and shower gel.